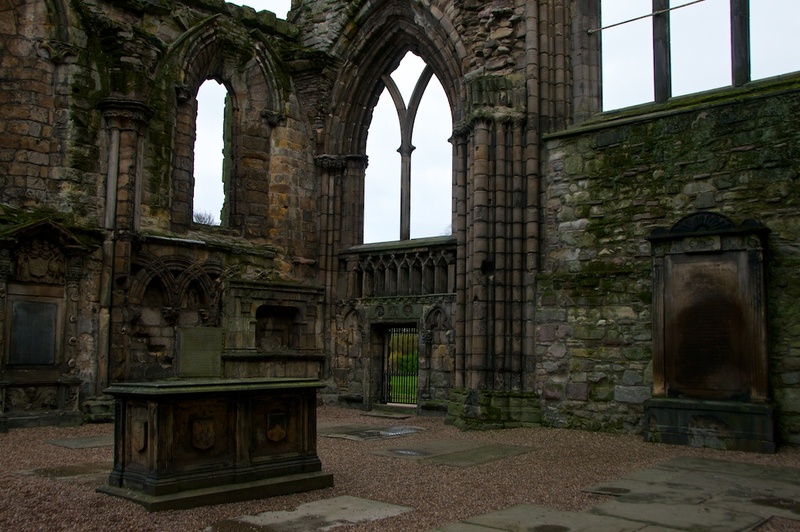 There can be few places in Scotland that can remember as many monarchs as Holyrood’s Abbey Church. This spectacular building, now reduced to a gaunt and rather forbidding shell, has witnessed the marriage of James IV to Margaret Tudor in 1503; the marriage of their son, James V, to Marie of Guise in 1538; the coronation of Anne of Denmark, wife of James VI, in 1590; and the Scottish coronation of Charles I in 1633. Some, like James II, were born at Holyrood long before the Palace even came into existence; and this particular James was also crowned, married and buried here. A legend tells that David I, son of Malcolm Canmore, was hunting one day in the woods below Arthur’s Seat when he saw a white stag with a glowing cross between its antlers. White stags were attributed with mystical powers, and David was inspired to build an abbey in the place where he’d had the vision. Whatever the truth might be, David never lacked enthusiasm when it came to abbey-building, and by the middle of the 12th century a community of Augustinian canons were making themselves at home in the shadow of Arthur’s Seat, the hill that rises to the south. 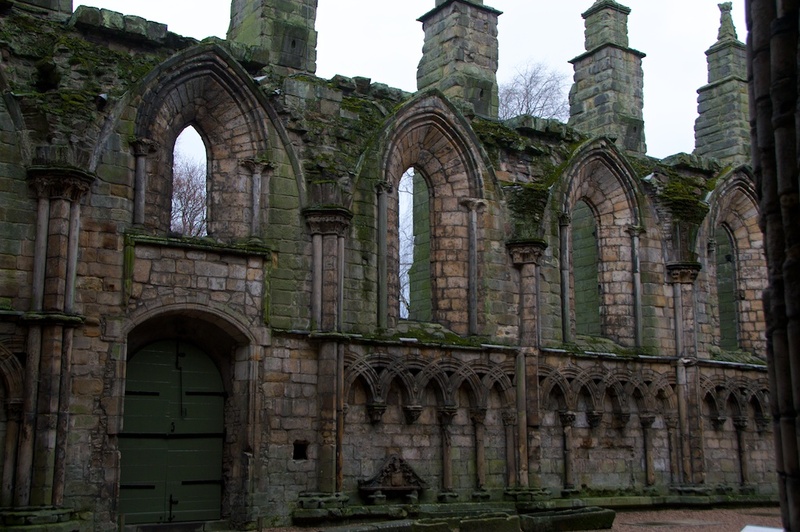 After a while, the royals began to find that their lodgings in Holyrood Abbey were more comfortable than the draughty heights of Edinburgh Castle; and so the idea of a Palace was conceived. The entrance to the nave, where it joins the north side of the Palace. From old plans, it seems that they were always joined around this point, but I’m guessing that the new Palace of Charles II was designed to make the best of any structural damage. 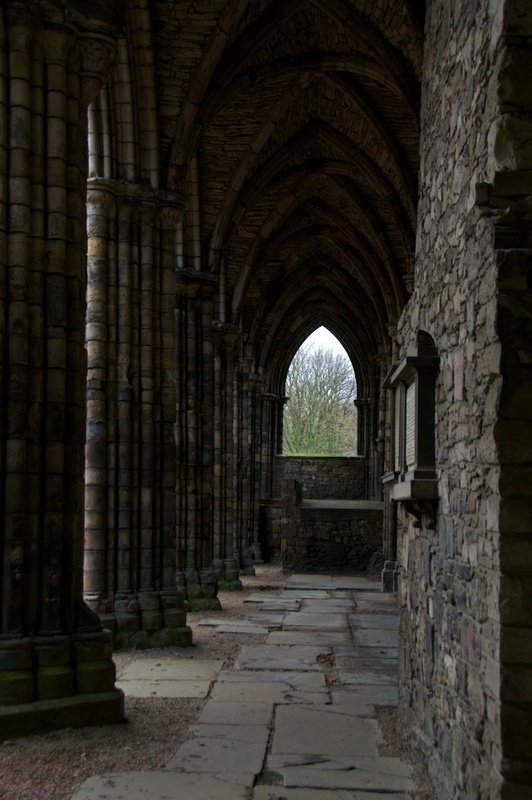 Most visitors enter Holyrood Abbey after a comprehensive tour of the Palace, and the ruins come as a huge contrast to the rich interiors with all their portraits, tapestries and panelling. You almost have to adjust your vision. I felt slightly disorientated while standing inside the church, possibly because the transepts and choir are missing; despite the fine large window that remains, I didn’t get a sense that I was facing the high altar. Added to this, the gardens were closed, as it was a week day in January, and you couldn’t walk around the outside to see the foundations and get a different perspective. But an information board (below) gave an idea of the original layout: on the plan at the bottom left, the surviving structure is shown in a red outline, with the Palace in grey. This shows that where you are standing is, in fact, the old nave, and originally the church would have continued eastwards the same distance again. The east processional doorway, part of David’s original structure of 1128, is roughly in line with the royal vault. 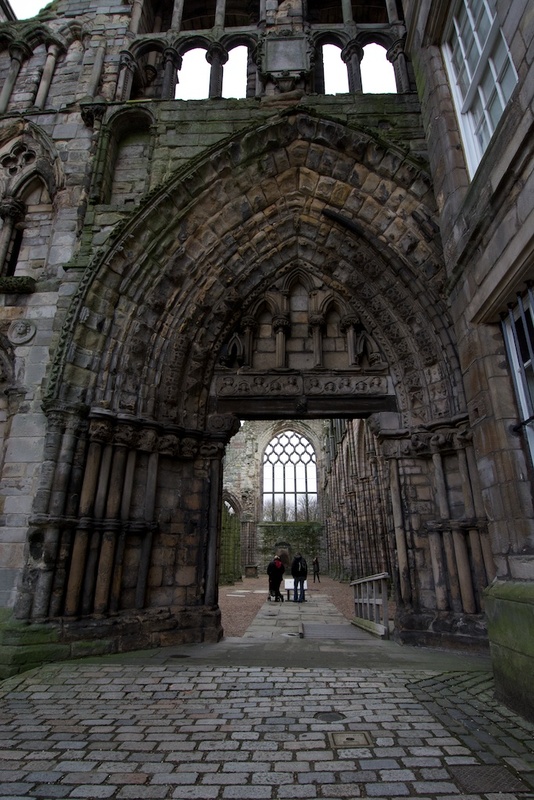 Historic Scotland tells us that the church was “lavishly re-built” between 1195 and 1230. 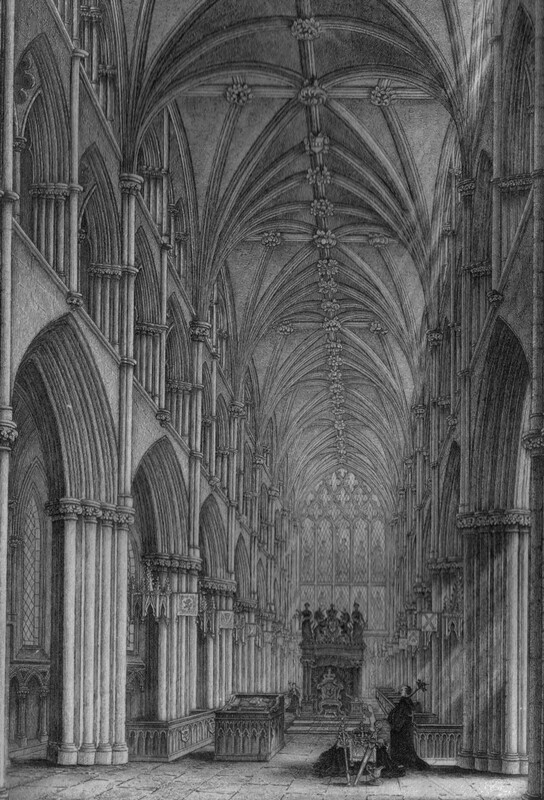 The main illustration shows the nave as it would have looked around 1500 – full of colour and light, and echoing with psalms as a procession of canons in black robes walked solemnly up towards the choir. 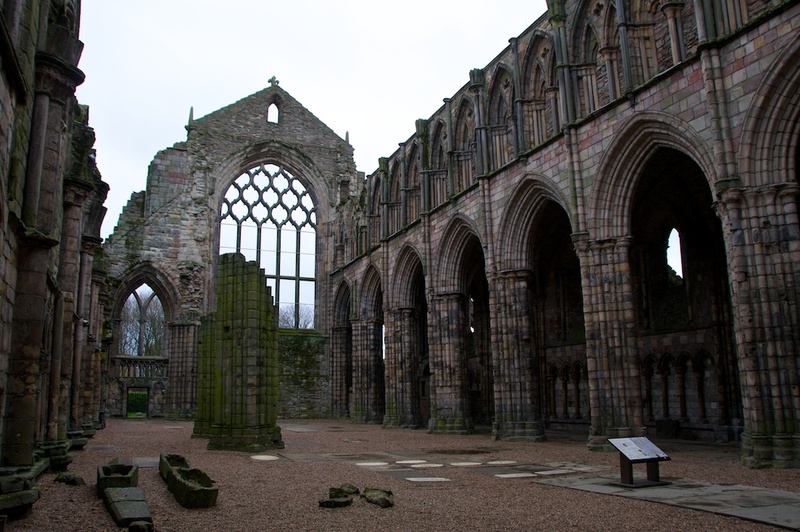 Like many holy places of its time, Holyrood Abbey originally offered sanctuary for common criminals. When the land reverted to the crown in the late 16th century, this right of sanctuary became restricted to financial debtors, jokingly known as ‘Abbey lairds’, who could take refuge from their creditors within the Palace grounds. In 1796 one of the most high-profile figures to take advantage of this was the Comte d’Artois, younger brother of Louis XVI of France, who had fled his country after defeat in the French Revolution. The Comte, later Charles X, was housed in Holyroodhouse itself, in the State Apartments which were refurbished in advance of his arrival. The 16th century sanctuary buildings (now a bookshop). Debtors could also claim refuge in Holyrood Park and Arthur’s Seat, and were allowed to walk freely outside the area on Sundays. When the English king Henry VIII wanted to force a marriage between his son, Edward, to the infant Mary Queen of Scots – a time called ‘The Rough Wooing‘ – Edinburgh was sacked and burned by English troops under the Earl of Hertford, and they didn’t miss the chance to attack Holyrood. 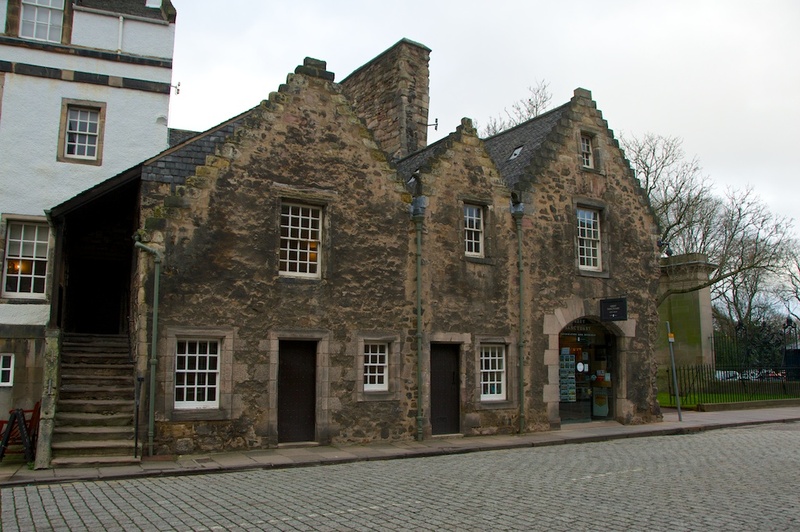 The ‘rascal multitude’ incited by the Reformation arrived at the gates just a decade or so later, bent on further destruction; by this time, the nave was being used as the parish church of Edinburgh’s Canongate. The choir and transepts, probably too damaged to save, were demolished in 1570. In 1633 the remaining structure was renovated for Catholic worship as the Chapel Royal, in preparation for the Scottish coronation of Charles I. It managed to hang onto its roof until 1768, when it finally collapsed. 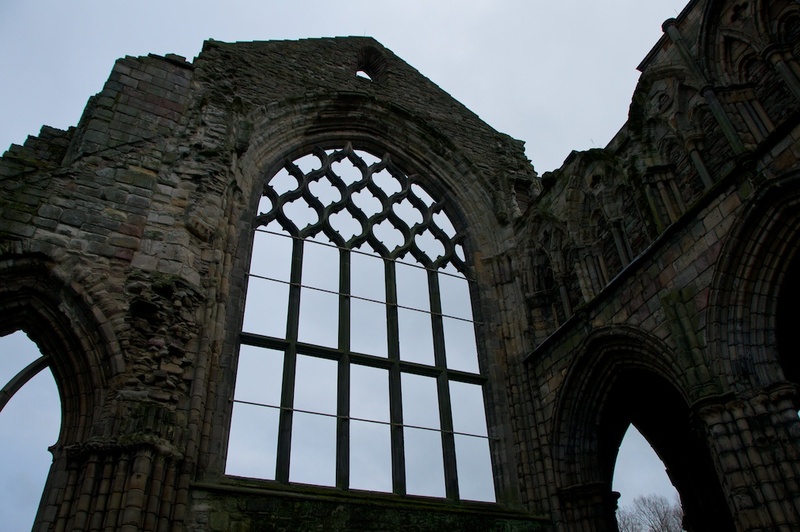 The impression you have of Holyrood Abbey today has nothing to do with its former life and glory; just the bones are left. It’s a bit like judging the appearance of James II from the contents of the vault. Sunlight once streamed into this place through stained glass windows, and glinted on the burnished copper hair of kings; but on a cold winter day it felt austere, withdrawn into itself, with only the drip of rainwater to mark the passage of time. The brilliance is gone, leaving jackdaws cutting black shapes in a wool-grey sky; and cold columns standing in silent ranks, the last guardians of the dead. 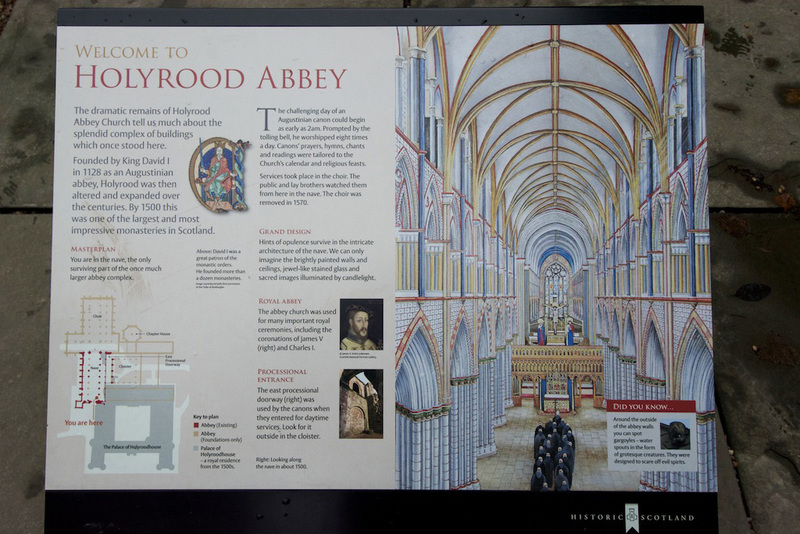 Holyrood Abbey can only be accessed via Holyrood Palace – please see their website for visitor information. 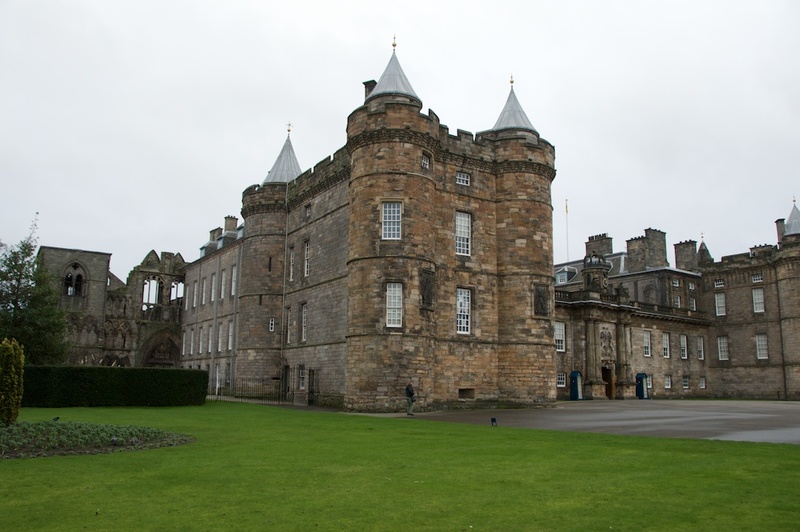 If you missed it, take a look at this feature about the Palace of Holyroodhouse. Great stuff Jo. To my shame I’ve lived most of my life in Edinburgh and never visited the Palace or Abbey. But I think you might have persuaded me to rectify that omission. Loved your bit about Queen Victoria and the mixed bones too! Great photos and information, Jo! The idea that the north wall goes back nearly a thousand years just boggles my mind. You don’t happen to know who the images represent that are carved over the doorway? Not enough for the disciples so I’m guessing saints. Dear Jo, I love and look forward to your posts. I have a question, concerning the entrance to the Nave, over the door is a horizontal lintel, carved with 10 heads. Who are they please? is there any record of their identities? Thank you so much for showing us all that I have not had a chance to see in Scotland. Thanks, Lynne! Hope you get up here soon. Perhaps in better weather! 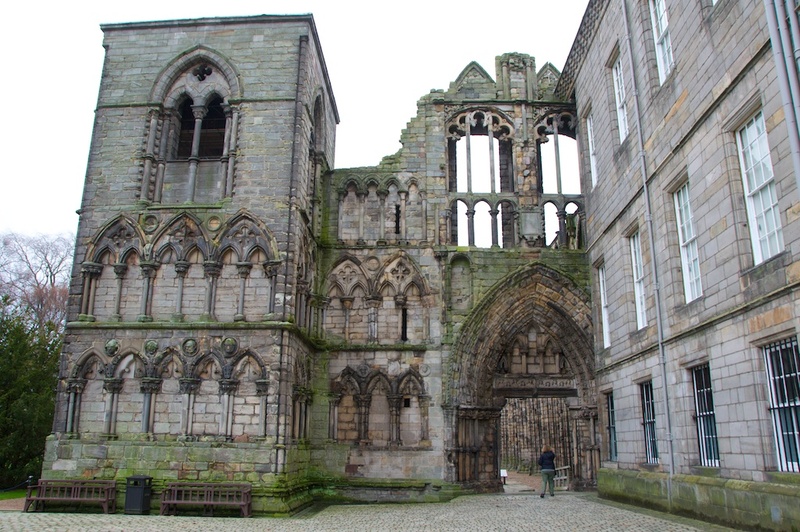 Doing some research on Holyrood Abbey, Jo, I was consulting your excellent blog post but noticed a wee mistake – Cromwell didn’t destroy the abbey in 1544 – that was the Edward Seymour, Earl of Hertford, later Duke of Somerset – during Henry VIII’s rough wooing’ of Mary Queen of Scots.